The Hotel Cà Bianca has all the comforts and facilities for guests who want to combine work with relaxation and recreation, turning a business trip into a short vacation. 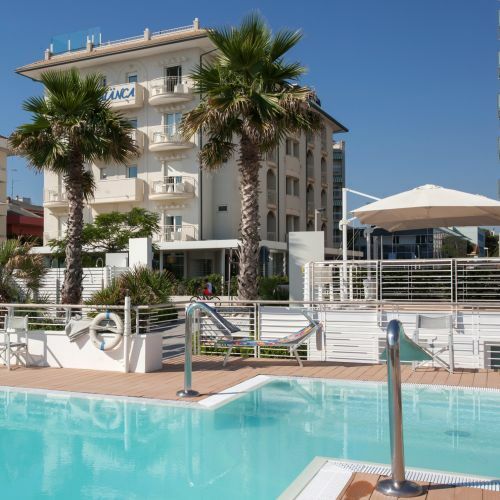 Located in one of the most beautiful areas of Riccione, directly on the sea, a short walk from famous night spots and restaurants, and a few minutes` walk from the famous Viale Ceccarini, where you can find the brand new conference centre of Riccione. The hotel is located approximately a 15 minutes` drive from the Fiera of Rimini. The hotel, completely renovated, offers elegant and comfortable rooms, fully heated or air conditioned as well as a meeting room with a capacity of about 30 people. The 60 new rooms with large balcony overlooking the sea, are completely soundproof and equipped with all comforts: mini-fridge, safe, direct call telephone, sat TV, free internet connection.